Once the target of an intensive development proposal, Surf Park now offers community members a tranquil setting with scenic views of Kettle Cove. In April 2001, The Trust for Public Land purchased the two-acre property—site of the former Surf Restaurant—and with the Gray Beach Neighborhood Association and Magnolia Neighborhood Association, launched a campaign to convert it into a public park. 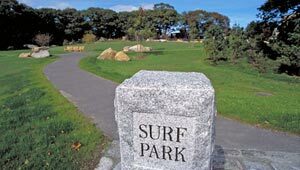 Funding from the town of Manchester-by-the-Sea, the federal Coastal and Estuarine Land Conservation Program, Massachusetts Urban Self-Help program, and more than 250 private contributors helped complete the park, which was transferred to the city of Gloucester and town of Manchester-by-the-Sea in June 2002. The Trust for Public Land also helped create the nonprofit Surf Park Trust to manage the park and its stewardship endowment.